It’s the Monday after a 3-day holiday weekend (Veteran’s Day), 11/14/2005. Having moved here earlier in the month we needed new plates and licenses. We arrive at the Las Vegas DMV at 7:30 a.m. The parking lot is crowded and a long line has already formed outside the front doors. Although the official day starts at 8 a.m., at 7:45 the doors open like a gaping maw and we happily allow ourselves to be eaten up by the building. We get into a snake-like line to show a clerk what we need and get a number. The line reminds me of being at a theme park. Maybe someday they will have some TV screens suspended from the ceiling showing driver safety films giving those in line something to watch. About 8-10 clerks line this counter. We finally get a lanky clerk with a pencil mustache and we cheerfully present our paperwork. He told us to get Nevada plates we first need a vehicle inspection and directs us to drive our car through a gate on the premises. He said when we get the approval paper to just come right back to him at the counter. Having done that, we learn that for our licenses we require more ID. We go back home and get proofs of identity for our licenses. When we get back a lady with cotton candy hair assigns us number A251…and that’s just the “A” group. An hour goes by and they are only up to A130. This is because there are other letter and number combinations like C294, K1369, etc. They represent different kinds of DMV needs, fleet vehicles, trucks, limos, etc. Tick tock, tick tock. After two hours, our number finally comes up and we get our Nevada plates and John’s license. The copy of my social security card was unacceptable so would have to return another day. The cost for plates and one license totaled $161. John gets his photo taken and in just a few magical minutes he is presented with a spanking-new Nevada license. We are free to go and I abandon my fears that the DMV is like a kind of “Hotel California” where “you can check out anytime, but you can never leave”.. 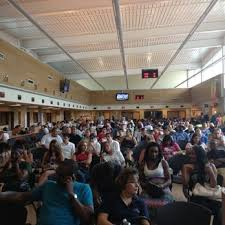 Sounds a lot like the Rhode Island DMV! !